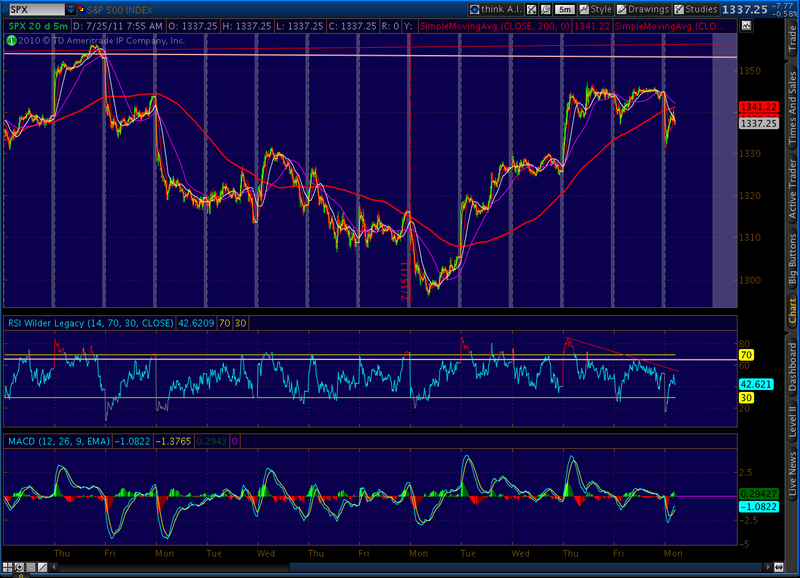 SPX, still at 1341, has had a few cracks, but so far no big plunges back down. But, it’s low volume and it has that distinct aroma of being propped up, today. Lots of gaps from minute to minute. 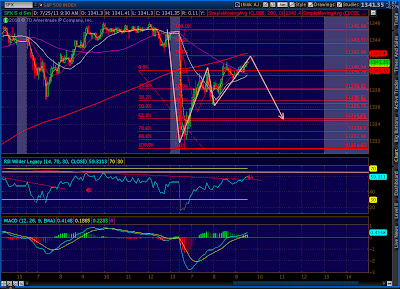 Still looking for a follow through to the Gartley and rising wedge. 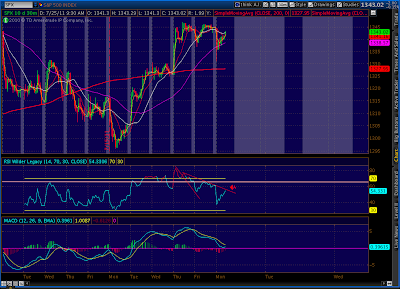 Together they point to 1330-1334 very soon. If I were the cynical type, I’d say TPTB need to let it droop a bit — maybe more than a bit. Otherwise, our fearless leaders might look at this rebound and conclude that a default and/or downgrade is no big deal. 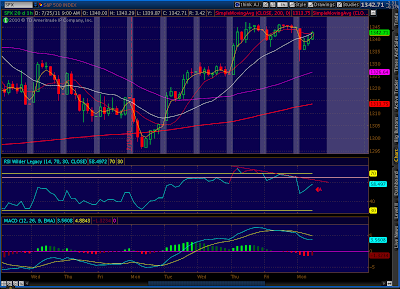 The market seems to have stalled at the 1343 level at the upper end of a rising wedge. Should fall any minute. 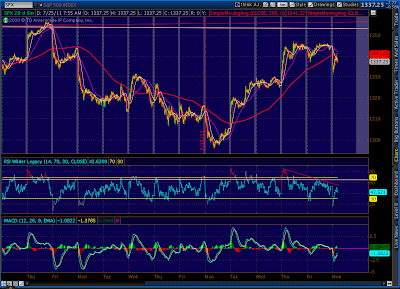 Looks like we overshot by a point or so on the upside; rose through the 5 minute RSI TL. We’ll see how we fare on the 30-min and 60-min. 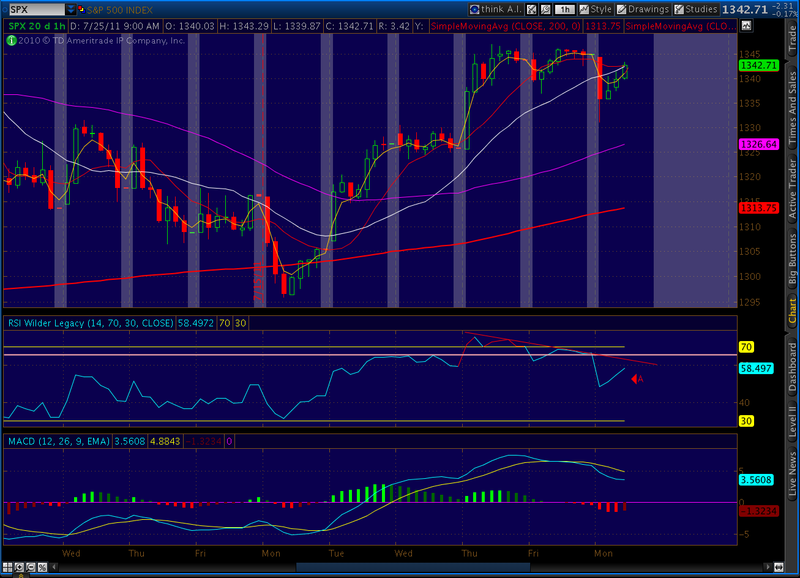 Note the position of the moving averages, just overhead. 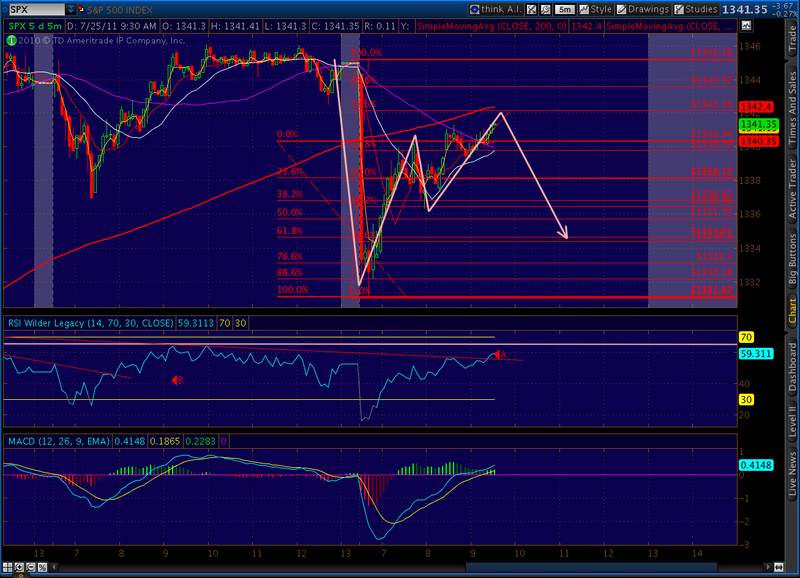 SPX will complete a little bearish Gartley at 1342.16 that could take it back down to 1334. 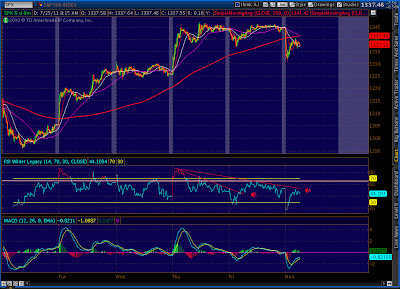 This morning’s carry over from the futures markets takes us down a bearish path. A “good” outcome from the debt ceiling debate looks less and less likely. While there may indeed be some resolution, awareness of our insurmountable financial problems is on the rise — both here and abroad. Investors are increasingly likely to realize that this empire has no clothes. As I discussed in yesterday’s post [The Chart That Really Matters] the one benefit of this drop is that we can have a nice little relief rally without jeopardizing the 1370 high. 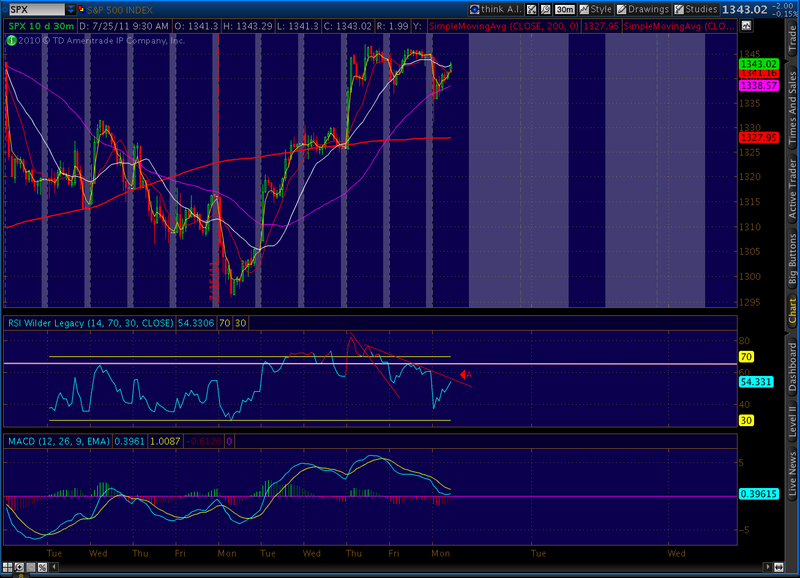 From these levels, even 30-40 might be doable, though I doubt we top even 1350 again. 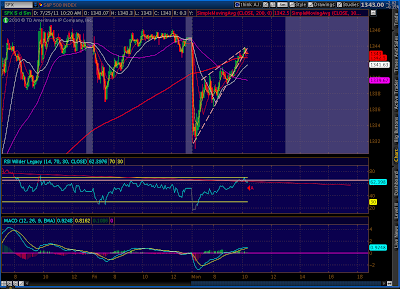 One chart I watch during the day is the 5-minute SPX. Together, they forecast a potential turning point in this morning’s recovery attempt — one that could be seen coming ever since the initial bounce this morning (see Point A below). 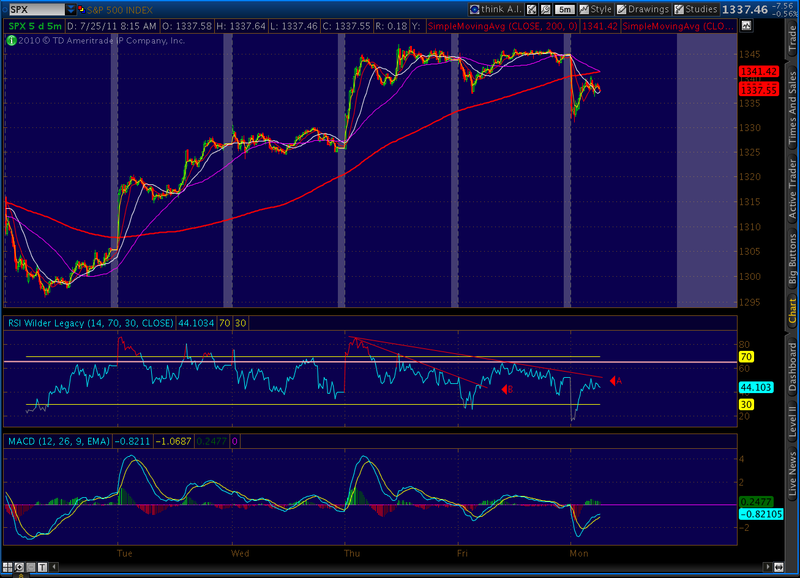 If the 5-minute breaks through this TL, it generally means it has some room to run (see Point B below). Otherwise, it marks a resumption of the decline. 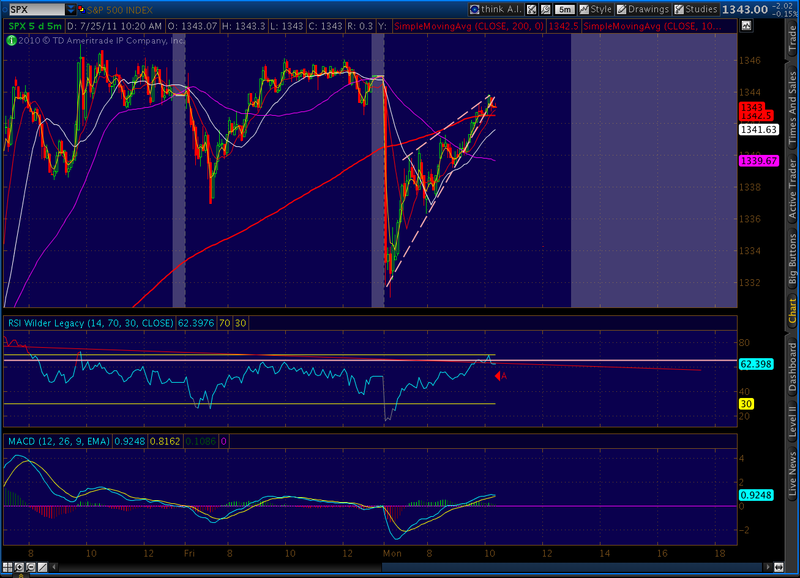 Here’s a close up of the same chart at 8:15 AM. Note the downturn at the TL. We’ll see if it holds or not.